The Aboriginal community of Cherbourg is about 250 kilometres from Brisbane. It is close to Murgon in the South Burnett region, in the traditional country of the Wakka Wakka people. Cherbourg was established by the Queensland Government in 1904 as an Aboriginal settlement and Indigenous people from across the state were then forcibly moved there. For many years, Cherbourg was a church mission. In 1986, the community was given title to the land in the form of a Deed of Grant in Trust. Today, Cherbourg has a growing population of about 2500 people, almost all of whom are Indigenous. It is run by a Community Council and provides a range of services for residents. There are also business ventures, including a commercial emu farm and other rural enterprises. In 2003, Cherbourg State School has about 250 students, from Kindergarten to Year 7 and Indigenous Education Workers (IEWs) can be found in each classroom. The development of literacy skills is a central priority and the school aims to generate educational outcomes comparable to other schools in Queensland, while at the same time nurturing a strong and positive sense of what it means to be Aboriginal in today's society. Chris Sarra has been principal of Cherbourg State School since August 1998. In recent times, the school has attracted positive media and other coverage, for the way it has worked systematically to improve outcomes for Indigenous students. In October 2001 Chris gave a very well-received address to the second IESIP National Conference. 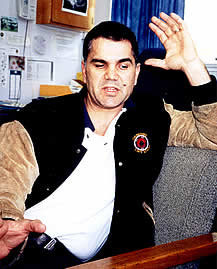 He later used this address as the basis for a detailed written account of the work at Cherbourg and this was published in 2003 by the Australian College of Educators (ACE) in its Quality Teaching Series, under the title Young and Black and Deadly: Strategies for Improving Outcomes for Indigenous Students. It is not possible or desirable to replicate the detail of Young and Black and Deadly here. Chris Sarra's comments below are, however, a restatement of some of his important themes, together with some elaboration. He was speaking in June 2003. I'd been to Cherbourg when I was working for the Commonwealth in the early '90s. ATAS and ASSPA were rolling out and so, strangely enough, I was the person who came in and set up the original ASSPA. We also used to bring students up here to visit when I was working at USQ. And it used to depress me coming here, to be honest, because you could just see so many things that you could do in a place like this that were not being done. There was rubbish everywhere and kids walking around with their heads down. And what was even more depressing was there was a sense of acceptance of it all. So we had to confront ourselves. And it was like there were two status quos in operation. There was a status quo in the school that was saying, well, we might be one of the worst performing schools in the state, but we can always blame the community for that, or the context of the children for that. So teachers weren't challenged or questioned about the poor performance. The other status quo involved the kids. They've been tricked into thinking that being Aboriginal means being on the bottom, like a lot of white people still might think that our people fit in right down there. That trick means that the kids don't aspire to achieve. We're trying to break that and 'un-trick' them, so they can have a truer sense of what being Aboriginal is. So when I say 'I want to use more Aboriginal approaches' in the school I'm talking about pride, identity and achievement. I'd known for ever that Aboriginal parents want children to be able to mix it with anybody in any other school and eventually access society in the same way that any other Queenslander would, or any other human being would. But not at the expense of cultural identity. In the first couple of months, it was a matter of just checking that against perceptions in the community. Hence the school wanting to be 'Strong and Smart'. We want to be smart enough to mix it, but we also want to be strong and proud to be Aboriginal. That's the vision. And then we got to a point where we said, look we've got to deliver on this for the kids. And at that point some staff left but we got new ones who could share the vision and share high expectations for the kids. It's not easy. You've got to keep the connections with the community, build on them and set up those links between teachers and the community. But there's always help around... sometimes it's an IEW, sometimes it's a community member, sometimes an Elder. There's someone who can help you when you're a new principal, coming from outside, to broker links with the community. When I came to Cherbourg I had Mrs Long, who was already working with the school, but wasn't really valued as she should have been. She already had the vision! I learned a lot just observing the way she interacted with the staff and people around the community, I knew that she was somebody I had to work with. You have to have these people working alongside you. And that's even more important for non-Indigenous principals. It irritates me when people say 'we need more Indigenous principals, like Chris'. That's flattering, but it's dangerous ground. Yes, we do need more Indigenous teachers and principals, but at the same time not having them can't be an excuse for not taking action, or saying 'we can't do much because we haven't got an Indigenous principal'. All it takes to make a start is good will. Just as outcomes were unacceptable, so was attendance. We worked with the community on it and then made it a public thing, where classes reported to the rest of the school each week, and there were rewards for the best attendance record. 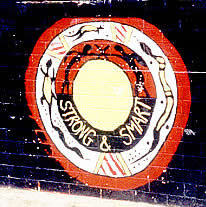 Getting rewarded along the way is part of being 'Strong and Smart', part of being proud to be Aboriginal. I insist on not using separate or watered down measuring sticks for our kids. When the time is right, they'll be measured against other schools and other kids in Queensland. I insist on that because the parents don't want to know some sort of fluffy outcomes... they want the real deal. They want to know whether their kids can make it in Grade 8, and is he or she going to survive. And that's it, really. But again, the subclause is that it's not at the expense of their cultural identity. We're not out to make them like non-Aboriginal kids, we're just focusing on academic outcomes. We want to do both things simultaneously, which I think we can do and we are doing. We aim for the same targets as the rest of the state and we're not there at the moment but we are on the move. We were dramatically behind but I won't be content until we're either up with it or in front of it. I wouldn't accept anything less. Some people say that the tests should be made more culturally sensitive and that's probably true. But the harsh reality is that we might wait a long time for those things to happen and what'll we do in the meantime? Nothing? Of course, we'll continue to have a role in improving the tests and giving feedback to the process to help achieve some change, but right now we need to be saying 'alright, the tests aren't that culturally appropriate in some areas but let's just get on with it anyway and make sure we get the steel in our brains to do it'. And I don't think we make them less Aboriginal by doing that. What it comes down to is the fact that those tests determine your levels of access to society. But I expect any parent should be able to come in and ask how a kid is doing and we should be able to bring up a profile that shows the kid's progress and show it to them, and it should be in a form they can understand. So we're able to say, well, look, this is where the kid is at and this is where he or she has come from. And this is where kids in Queensland are expected to be at this age. So there's no nonsense about it. And where parents don't ask I do the asking instead. Because I want every kid to succeed. An Education Queensland Review of Cherbourg in 2002 features the following information. Literacy, Year 2 Net: % of students not requiring additional support in Reading and Writing increased from 6.7% in 1997 to 57.1% in 2002, an increase of 50.4%. Numeracy, Year 2 Net: % of students not requiring additional support in Number increased from 20% in 1997 to 53.6% in 2002, an increase of 33.6%. Attendance: An improvement from 50% regular attendance in 1997 to 95% in 2002. Apparent progression: The apparent progression of students from Year 1 to Year 7 increased from 52% in 1999 to 75% in 2002, an increase of 23%.